Employers often underestimate the true cost of a full-time employee. We're breaking down how much employees actually cost and whether or not hiring temporary workers is a more cost-effective staffing option. You have a number of job openings but no time or resources to fill it. This is an all too familiar situation most Recruiters and Hiring Managers fear. Luckily your Human Resources department has the option to utilize a staffing firm to help you recruit qualified candidates. How much do temps actually cost? Is it more than what your current full-time employees cost? 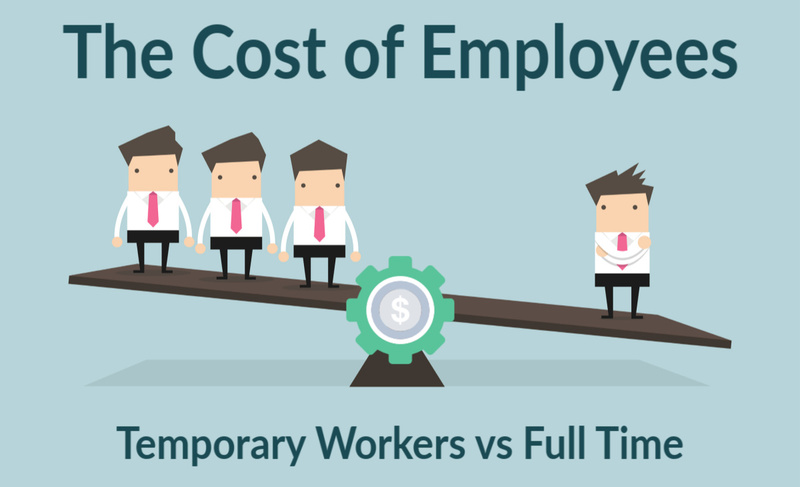 Let's dig into the factors that make up the true cost of employees- both full time and temporary workers. There are numerous expenses associated with full time hires. Employers pay a whole lot more than just the base salary for their employee. In addition to wages, employers also pay for benefits, local, state, and federal taxes. Employee benefits and taxes are among the #1 top costs of full time employees. One of the best reasons for utilizing a staffing agency is that your company is not responsible for providing these benefits. Depending on your company's specific benefits you offer will all play a factor into the cost analysis. Full family benefits such as health insurance costs typically rise each year. Don't forget to calculate paid vacation and personal or sick days in your budget. PTO is a costly expense employers are burdened with. 401k matching and profit sharing costs tend to vary by employer, but don't forget to factor this into your cost. Temporary (contract) employees only work the specified hours or days you need them, so you only pay for the time worked or until the project is completed. So in-comparison to full time staff, contract workers cost much less than salaried employees. Workforce flexibility, hiring speed, and access to available talent are just a few of the top benefits of using a staffing agency. Staffing agencies take care of the entire recruiting process from the very beginning to the employees' last day on the job. The administration of time consuming tasks such as screening resumes, conducting and coordinating individual interviews, sending out skills testing assessments, posting to job boards, social media, and other marketing tactics are all done by the employment agency. Many clients turn to staffing firms to hire better employees, speed up the hiring process, and try out employees before making a hiring commitment. Taxes, workers' compensation, local and national taxes, unemployment, SUTA, FUTA, as well as offering temporary workers the benefits provided by the staffing agency. All taxes are paid by the staffing agency, so your company doesn't have to handle any of the employer taxes associated with temporary workers. The markup rate covers the costs of insurance, taxes and administrative fees. Even though you pay a markup, you are not paying payroll taxes and expenses, including workers’ compensation and benefits. The markup percentage varies by agency. We're sharing our temporary staffing pricing model explaining 2 fundamental pieces of data needed to understand your staffing agency Bill Rate; the Hourly Pay Rate and the Markup Percentage. Temporary workers are known to result in increased productivity within the workplace while helping to control staff costs. Temporary employees typically have less distractions and as a result lose far less of their work hours. If you have an increase in production, extended shift hours, or a short-term temporary need, the most cost-effective solution is to use temporary personnel. We've all been there. The cost of a bad hire can be extremely costly to your business. However, one major benefit of a staffing agency is that you avoid paying for any costs associated with a bad hire. This is part of the staffing guarantee- or Temp-to-Hire period. Staffing services will lower costs, improve employee focus, and reduce the risk of a potential bad new hire. Temporary employees recruited by a staffing agency are more beneficial and cost-effective to your company in the long run. If you're new to the staffing world or are looking to switch to a different staffing agency, you've come to the right place. If you're not sure where to start, download our free Comprehensive Guide to Staffing Agencies in Texas. Are you looking to grow this year? Learn how TPI Staffing can help your company with your staffing needs!